For this week’s post, I thought we might look at the creative personality. Are the old “saws” true? Do you have to suffer for your art? Are we all a little mad from our obsession? Basically, are we in some way different from the others? Is artist a magical gift/curse that is only given to a few? 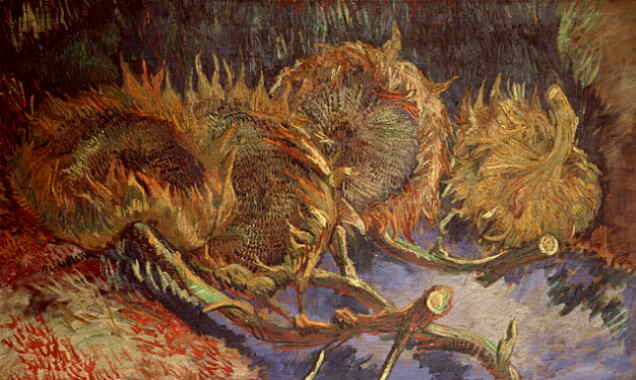 Certainly Van Gogh suffered from isolation and rejection; and probably some sort of physical or mental disorder. However, the art he made gave meaning to his life. It may have been the only meaning in his life. To quote from”Creativity for Life” by Eric Maisel based on the Schizophrenia Scale of the MMPI studies: “Let’s ponder for a moment the sorts of questions that distinguished between artist and schizophrenics. Asked if they preferred daydreaming to doing anything else, they tended to say yes. Asked if they felt understood, they tended to answer no…… These are only a few items on the scale. Among the remaining questions are one that probe for eccentricities, delusions and the like. It does not surprise us to find that artist tend to show slight elevations on the scale. For the artist is intensely involved with her own thoughts, feels occasionally misunderstood, injured, and isolated enough to begin to climb the scale.” Are we to assume from this we are a different breed? 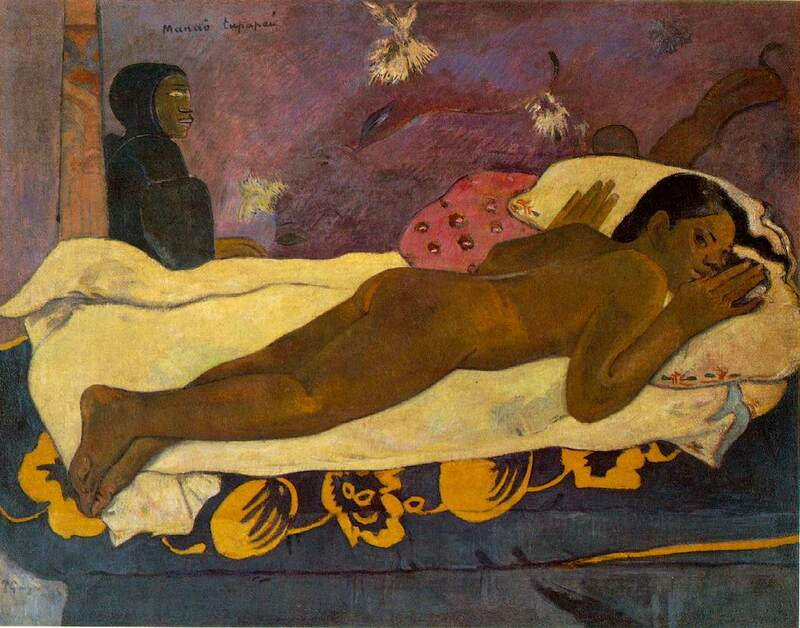 Gauguin felt so encumbered by his family and the society in which he lived that he left them all to travel to Tahiti. There he felt he could be dedicated to his art in a way that was not available to him in polite society. He was allowed to explore imagery that gave him hope for a new way of life. Of course, he abdicated his responsibility to his family, felt no one understood what he was trying to accomplish but now he is lauded for the work. Have any of us ever longed for this type of isolated, intense period of work? To thumb our noses at the accepted norm for art and do only the work that is important to us? Are we so worried about getting into shows that we do only what is in vogue with jurors or collectors? These are just two examples of rebellious artist. The list is long: Picasso, Pollock, Cocteau and on and on. However, my feelings are these are still issues we are dealing with today. To create a style, solid body of work, there are times we must isolate ourselves in the studio. We are required to daydream, to become lost in our own thoughts in order to discover the imagery that reveals us as artist. Occasionally, we must go against the accepted norms of the times we live in to give meaning to our work. Indeed, making meaning for ourselves is the ultimate responsibility for an artist….there are already enough Thomas Kincades. While we would all love to constantly get acceptance letters; we must go through the rejection letters from shows, galleries or our own peer group. Is is possible that we have more in common with the rebels than we realize? 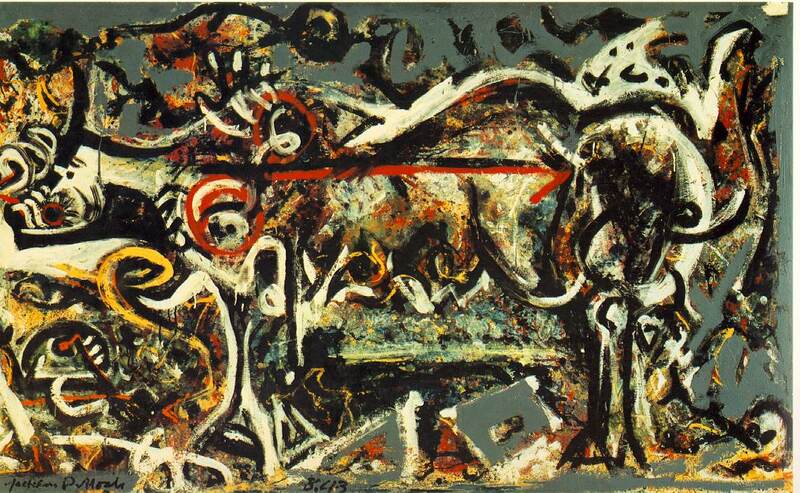 For all his success, Pollock was never secure. Thinking he never measured up, he was driven to drink. His addiction effected his ability to produce work. No matter how Lee Krasner tried to save him, he was driven to self-destruction. Is obsession a good thing? Possibly if he had been secure enough to ignore reviews and trust his own vision, his obsession would have turned from negative to positive. Certainly clinical obsession is a disorder that needs treatment, but the drive to create is an obsession we all live with daily. The musings expressed here so eloquently give me hope that we, as artists. do not live in a perpetual vacuum, but rather in a state of a positive creative angst. It drives us to create in whatever medium we choose, be it traditional commerce or a Pollock-like vision. Balance is the key, and obsessing over any aspect is unhealthy to the other, just as important segments of our lives. Wonderful discussion. Responsibilities and family obligations aside, I wonder sometimes if I’m missing out of connections with family and friends, as much time goes by between seeing them. It’s hard to gain slots of creative space at the moment. But I feel I must follow these weird and wonderful urges when they happen. They can lead to making art or thoughtful reflections. Those stopping off places become leaping off places. These are the times when gratitude overflows and I can appreciate my loved ones so much more. Art is my doorway. What a fascinating discussion. I’m in the trenches now with a house full of children to care for. (ages 2 – 14) I long for the day of uninterrupted studio time and the luxury of full immersion in the creative process. I do feel that my art cannot go quite to where I’d like it to, but for now I will take what I can get. I’ll tell you why. I want to make the world a better place. Some day that might be through my art. For now, sacrificing my time to raise contributing, productive, resourceful and caring citizens will have a far greater impact on the world than anything else I could do. To be quite honest, the world doesn’t need another Jackson Pollock. It needs more people who care and are willing to do something about it. More Desmond Tutu’s Mother Theresas. I’m willing to be happy with limited studio time. There are times when my artwork has something to “say” and then I find myself immersed in my studio, neglecting my wonderful family. Fortunately I am able to emerge again to a loving and understanding family as they know that if they truly need me I’m there for them. They’re a pretty supportive and independent bunch. I’m a hopeless optimist. I think it IS possible to be healthy, well adjusted, and make meaningful art. I don’t aspire to be a “Kinkaid” (yuck)but am transported by artists who have created beauty. I think the artwork I do now IS at times meaningful although much of the time it is just for fun and play. Nothing wrong at all with that. There will be a season. I DO believe I can live a happy, balanced, CREATIVE life but no… I can’t do everything all at the same time. And I also believe that far more people can be artists. Not every single person, but far more than there are. There are skills to be learned, time to be spent practicing, choices to be made. An artist isn’t often born fully formed… every once in a while yes. Just imagine what the world would be if right along with learning to read we were taught the visual alphabet and how to “see” and get it down on paper. The thought sends shivers up my spine. If obsession and at least a bit of madness is common to the majority of artists (and as Olga points out, probably most really successful people in any field), would that mean that the converse is true as well? Are people leading “healthy,” balanced, responsible lives doomed to a life of mediocrity? Reading Eric Maisel’s book, “Fearless Creating” has made me think that I do not have nearly enough trauma and angst in my life to harness and use to create incredible art. Of course, that knowledge is not going to stop me from creating the work that I feel compelled to make. But seriously, there are enough historic examples of destructive obsession amongst groundbreaking artists that I can understand Melanie’s students’ need to foster addictive lifestyles for the sake of their artistic goals. And, the inherently nurturing (read responsible and balanced) nature of women would preclude most of us, and with it the mostly feminine genre of fiber arts, from reaching the artistic heights only attainable through the exclusion of monetary, familial and societal distractions. Hence, perhaps, the marginalization of women in the arts. I’m not sure I’m ready for a society in which more women throw off the “shackles” of responsibility and leave their families and communities to fend for themselves though (more babies born with fetal alcohol syndrome, latchkey kids roaming the streets finding community in gangs rather than family — no thank you). That’s taking it a bit far, but maybe a bit of mediocrity is OK — not everyone needs to be the next Pollack or Picasso. I wonder if the personality you are describing is not common to all people who are really successful in their chosen field, not solely restricted to artists or artistically or scientifically creative people, but even to business leaders and even politicians. It’s this business of being embraced completely by one’s work to the exclusion of most other ‘distractions’ like family, or servicing oneself, or even general social communication with other people not engaged in the same activity. Brilliant if one can get away with it! Hey June, Thank you for the great explanation of what I was trying to bring up for discussion. As women we are often unaware of how we get distracted by external influences. In “Women Who Run With the Wolves,” there is a thoughtful examination of the women who are drawn to men who are poets, painters, etc., because of their own desire to be artist. They subsume their own art to be near the act of making art in the men. Picasso is famous for killing the spirit of the women who “loved” him. As luck would have it Francoise Gilott escaped, Dora Marr did not. So no I have no affection for the dead white men who are so damaged that they damage others….yet, on the other hand, I understand their “compulsion.” Another buzz word, I know, but I agree it maybe impossible to discuss this subject adequately with words. Once when I was totally immersed in the studio, my husband walked in, watched me working until I noticed him and without any warning said,”Just imagine where you would be if you hadn’t been obligated to taking care of all of us all these years?” Of course, I responded appropriately by saying, “Yes, but look at what I have accomplished with you?” Intuitively, we both knew the difference it would have made. Sorry for the long comment but your post really got to the heart of the discussion I wanted to start on this subject. It all depends on how you define “balanced” I suppose. Trollope wrote 48 novels and a bunch of other stuff, worked full time setting up rural delivery in Ireland for the British post office, and rode the hunt (or whatever you call that British chasing of rabbits through the countryside). He got up at 4 AM, wrote until 7, went off hunting until 10, when he went to the PO and worked until 6, after which he retired to dinner and good company. I think that quilt artists are especially susceptible to a couple of seductions that prevent them from fully immersing themselves: the first is the responsibility of family and jobs, particularly since most quilt artists are female. But the second is the seduction of praise and, for lack of a better term, “the pretty.” The praise can come when you are working in the expected ways, the expected styles, and people see instantly that you are doing pretty work. That seduction, allied with the difficulty of immersing oneself so as to break through the usual, is deadly to art. Not, may I say, to creativity– creativity is larger than art, comes in many forms, from making cupcakes to building hospitals. But making art is more specialized and requires a kind of intensity the being creative doesn’t necessarily require. My language may not be your language for what we are speaking of. Like Jane, I have little sympathy for the men who were both reliant upon and patronizing to women who took care of them. And I think, like others here, that disabilities of whatever sort are not necessarily ennobling or wells from which to draw creativity or art; sometimes they are just problems to be faced every day. So words like “obsession” and “madness” may be incorrect, too technical or too personal to be useful in this discussion. But there’s something to full and total immersion that I think is essential to breaking through the cultural banalities and notions of beauty with which we are surrounded, breaking through the barriers of cultural expectations and taboos, and getting to truths that can only come out of extended visioning and working. Maybe another word for the kind of activity that leads to artmaking is “mediative creativity.” Meditation is an obsessive activity, a full immersion that loses the self to the activity. So the language we use may be inadequate for what Gabriel is exploring. But I think there’s an underlying truth that is worth airing. Some quick research reveals Alexander Calder and Andrew Wyeth as artists with balanced lives. I couldn’t find any mention of “madness” or extreme self-absorption in the multiple bios that I read. Of course, I am willing to stand corrected as well. Hi Jane, I wish that the balance of passionate and responsible artists did out number the artist who are totally self-absorbed…but I fear it isn’t so. However, I am willing to stand corrected, can you give us some examples? I see it all as compromise. You can be both but not at the same time. We live multi-dimensional lives constantly juggling time in the studio, working on marketing and taking care of family obligations. When one over powers the other,something has to go. I highly recommend Eric Masisel’s book Creativity for Life. It was this book that sparked my recent post. I think it is an invaluable tool for artist of any media. I think it’s obsession that can become so destructive – to self and to others. Beyond the stereotypical “divine madness” of the artist, there is the stereotypical “mad” scientist who neglects his family and their well-being (not to mention his own) to toil endless hours in the basement inventing the next great thing. Or the stockbroker who works 80-90 hours a week chasing a material victory. Passion in one’s work is desirable, but obsession can easily be extremely unhealthy. The stories of artists like Gauguin who abandon their families and all of their responsibilities to pursue their art are depressing to me, irregardless of the resulting art. The stories of artists who manage a balance of passion and responsibility aren’t as interesting but I’m betting their numbers are vastly greater. As lead barista at the Cafe, I have no objections to you running anything I write. But Gabrielle is “owner” of the original post, so she needs to give permission. And the others who have commented should also be asked if they mind your using the material. Thanks for asking. It’s good to know that what we say serves a lot of differen functins. I would like to copy this as a discussion onto our site Creative Cafe which is set up and run by volunteers with mental health and physical disabilities and see what our members think? Our members include people with disabilities and those who have none. If you agree I will of course put the link back to this original article. I’ve thought about these questions a lot as I have watched my very creative father die at a very early age (48) from alcoholism and have strived to balance my creative side with my practical,reasonable side for years. As a minister I’ve thougth about the divine creator and while I recognize that not everyone believes there is a divine creator, I do, and I believe that God created, and continues to create,out of the raw materials of chaos (Genesis 1). We, as creative human beings, created in the divine image have within us the ability, may I say even, the overwhelming urge to create. For many of us we create out of the raw materials of whatever chaos we have found ourselves. Melanie, My apologies if you took my post as glorification of any mental illness. If you would read the last paragraph again, I think what I am advocating is the acceptance of ourselves as not being, for lack of a better term, an every day Joe. I truly believe like June that we are driven to make meaning in our lives through our art. The examples I used were on the far end of the scale as a cautionary tale. However, I do not believe in the recent movement that everyone can be an artist….yet I do believe that everyone is entitled to self-expression. My work is an attempt to lead an examined, meaningful life. Like June, I am blessed with a mate that understands my need to dream big dreams, hold up in the studio for hours and question constantly where to go next. Art is what renews our souls but whether we wish it wasn’t so or not, it can also be a burden. To believe that the life of an artist is the same as the steady income of a 9 to 5 job doesn’t take into account how hard it is to get published, get a record contract or sell a piece of work. That you have found healing through art is a testament to creativity. I celebrate the gift art has given you. Please know that I trust in the joy of creativity. Being a pragmatist and knowing myself, there is still days that I doubt everything I do, long periods where the well is dry and days when I want to throw it all in the trash bin. So maybe that was my point: no matter where you are in your career you still have the same issues that you did when you first started only later in your career they are either less or more intense. Excuse the typo (17 for 10) but observe the point, please. I concede that I may be hypersensitive to this issue: I teach creative writing at a university. A significant proportion of my students sincerely believe that to be successful as artists they have to be some kind of addict or certifiably lunatic. I put a lot of effort into undoing this sad and dangerous notion. I’m also medically mentally unwell. I’ve spent a good deal of my life battling depression which is a real, painful, debilitating, and too often fatal illness. It is neither glamorous nor empowering, not even a little bit. I am able to be here to talk about this for two reasons — antidepressive medication and art. Art, first by observing it and now working to create it, has quite literally saved my life and become the ground from which I can make useful contributions to the lives of others. Art saved my life because however wildly abstract any particular example may be, it is still order, not madness, not as I know madness to be. Pousette-Dart said that “”Art is the dynamic edge between the conscious and the unconscious. It is [the] position of transcendental awareness.” And that’s what art gives me — a way to be whole while negotiating that edge, a way in and, more importantly, way back out. Are there examples of artists who were all kinds of ill and still managed to work? Of course. But there are many more examples of people whose lives (and the lives of the people around them) are completely blighted by their illnesses. Not all artists are mad, not all the mad are artists. Am I sometimes insecure of my abilities and reception, jealous of the success of others, impatient with responsibilites? Sure. Is this what it means “to be an artist? Only so far as this is what it means to be a human. I think that fetishizing these things sets a bad and dangerous example, and, especially, that conflating madness and creativity cheapens both and illuminates neither. Speaking for myself, I would say it isn’t “madness” but obsession that drives me. I worked like a fiend today, ate dinner, went back to the studio to clean my brushes, but saw that there was just one thing that needed doing — and two hours later, I emerged, falling over with fatigue but deliriously delighted with what I discovered. And painted. It’s hard to be obsessed, and harder to live with someone who is obsessed. I have done so in the past, and didn’t like it much. Oh, and what did I discover that made me delirious? That the scene I was painting had a sun that was setting, slowly, and the dusk was drawing over half the landscape while the other half was brilliant gold. how I do love painting brilliant gold. And I even got to play with some snow (painted, of course, not real). Oh, oh, (this is like PS #2) I’m at an artist residency in Montana, where there really is snow to paint. And the sun really does go down at 4 PM, but first lights up the hills above the basin in which we live. Here are just a few picks from the bio: Orphaned at 10,lived with older brother who forbade him to copy music. Maria died in 1720; remarried to Anna Magdalene Wilcke in 1721; had 13 children of which 6 survived to adulthood. I think there might have been some issues going on in his life. His work turned to solely religious themes….searching for something, maybe? Not sure where you got the quote but he appears to have been cared for by his sister throughout his life…however there were never 17 children running around while he was creating.Just the thought gives me shivers. When discussing the so-called artistic personality, why is it that no one ever cites Bach who produced a torrent of exeptional work while securely nestled at home with his 17 children?